﻿ Entrepreneurs Shine During National Small Business Week » Red Mango Marketing! National Small Business Week shines a spotlight on our nation’s 30 million small businesses. Through awards ceremonies, media interviews and community events, we honor entrepreneurs whose achievements stand out. As an entrepreneur myself, I know the hard work that goes in to starting and building a small business – efforts that don’t often get the attention they deserve. Honorees in this week’ spotlight do not cast a shadow that dims the efforts of others; rather they serve as a beacon – to competitors, up-and-comers and communities as a whole. They show what is possible. They are innovators and problem solvers, creating products and services that are better, smarter or more efficient than what came before. They are risk takers. And through their success, they inspire others to dream and to create small businesses of their own. 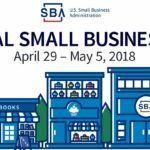 The post Entrepreneurs Shine During National Small Business Week appeared first on Constant Contact Blogs. This entry was posted on Monday, April 30th, 2018 at 8:00 am	and is filed under Business Tips, Fresh Insights, News & Updates, Small business tips. You can follow any responses to this entry through the RSS 2.0 feed. Both comments and pings are currently closed.